Last December, the Texas Tribune and ProPublica published a remarkable investigative report titled “Boom Town, Flood Town,” that raised powerful arguments against the status quo of flooding in Houston. • flooding caused by developers’ failure to include adequate drainage and water detention, if any. The Tribune/ProPublica article, which required months of research and probing, changed the conversation. It verified that urban flooding is real, it occurs outside of floodplains, and is caused by developers. However, Houston drainage engineer Michael Bloom of RG Miller Engineers, Inc., and Steve Stagner of ACEC Texas wrote a rebuttal to the Texas Tribune article. They called theirs “Boomtown, Flood Town” Reconsidered: An Engineer’s View. On this web page, Residents Against Flooding (RAF) analyzes their rebuttal comments point by point. Their rebuttal comments are in blue italics, ours are in black. Bloom/Stagner: Flooding is a terrible thing to experience. Floods destroy personal belongings and homes. They create a stinking mess that must be cleaned up. They can kill drivers in below-ground underpasses. They displace families. But modern floodplain management efforts are really much better than you probably think. RAF: Or worse than you think. Mapped floodplains in Houston are associated only with riverine flooding (natural bayous, streams), yet almost 70% of Harris County’s flooded homes were ruined by urban flooding and are not located in any floodplain affected by riverine flooding. Bloom and Stagner fail to mention urban flooding at all in their rebuttal – yet urban flooding was central to the Tribune/ProPublica investigative report. That 70% number is according to FEMA. Let that sink in. Industry engineers like Bloom and Stagner are focused on the mapped floodplain, or rather what FEMA currently defines as the floodplain, but the majority of flooded homes are in areas outside a mapped floodplain. FEMA requires that studies that show increased flooding be submitted to them within six months of publishing. We are aware of several engineering studies that have not been shared with FEMA, including a 2012 $750,000 analysis of the area around TIRZ 17. These studies show that neighborhoods surrounded by areas experiencing explosive growth will flood badly in 100-year events. If they had been shared with FEMA, then a Special Flood Hazard Zone might have been created, stopping rampant fill elevation and enforcing 100% mitigation of stormwater runoff. Bloom/Stagner: In December, the Texas Tribune and ProPublica jointly published “Boomtown, Flood Town,” an article on flooding and development in the Houston region. The engineering community, which is on the front line of stormwater management, development, wetlands, and surface water quality issues in the Houston region, has a somewhat different perspective on these issues. RAF: It appears the engineering community is not as much interested in mitigating flooding as they are in finding ingenious ways to circumvent what many engineers feel is overly burdensome regulations. For example, “Flood Czar” Stephen Costello doesn’t think it’s fair to make the entity redeveloping a property pay for “the sins of the previous owner” by requiring them to install missing stormwater detention. We disagree. Whenever a homeowner rewires his house, they are required to bring it up to code – a 1900’s home is not allowed to continue to use old knob and tube wiring because it’s clearly not safe. The same is true of detention. Missing detention endangers us all. If the buyer knows that detention will need to be added, then the cost of installing that detention needs to be negotiated in the sales price of the property. Even so, if the City of Houston wants to continue to subsidize redevelopment, they can offer tax incentives to help offset the developer’s costs. Bloom/Stagner: Since 1989, approximately 23,000 of the 1.5 million houses in Harris County — or 1.5 percent of the homes — have flooded from rainfall (not including coastal surge). In addition, the region experienced fewer than 60 of 9,500 days of high water during the same period — representing 0.6 percent of the time. RAF: First, 23,000 homes flooded since 1989 seems low. Especially when HCFCD Meteorologist Jeff Lindner told Memorial SN (page 5) that 17,300 homes flooded from Spring 2015 to Spring 2016. (More importantly, 19 people lost their lives during the same period.) That would mean that only 5,700 homes flooded during the 26 years from 1989 to 2015, a time that includes Tropical Storm Allison and Hurricane Ike. Although very unlikely, for the moment, let’s assume that the numbers are correct. At an average price in today’s market of $230,000, 23,000 homes represent approximately $5.2 Billion dollars of real estate. But the costs of flooding extend far beyond the value of a house. Flood insurance doesn’t cover irreplaceable mementos, six months or more of living elsewhere while your home is unserviceable. It doesn’t cover the drop in home prices, covering multiple mortgages if you have to move and can’t sell, or eating out and covering a new, longer commute while your home can’t be lived in. Due to delays in securing grant money to elevate their homes, some people remain in rental property two years or more after their homes have flooded. According to the Houston Chronicle, FEMA has funded buyouts of more than 2,000 Harris County properties since 1985, primarily targeting homes in the 100-year floodplain, where about 105,000 still remain. So there are 105,000 homes that can potentially flood – over 4 times the analysis in the previous paragraph – representing a whopping $24 Billion in home value. Yet, this hasn’t dented Urban Flooding which happens outside the floodplain. Remember, 70% of homes that actually flooded aren’t included in the mapped floodplain. While it would be nice to ignore houses lost to storm surges, the fine research of the SSPEED Center at Rice, Texas A&M and UT, shows it’s obvious that buildings in the path of a storm surge need special engineering. Certainly, elevation markers clearly showing storm surge elevations** from category 1, 2, 3, 4, or 5 hurricanes can easily be placed in affected areas because they are already mapped. Then if homeowners are willing to take a chance with their lives and those of their children, they will do so with clear knowledge and intent. Discouraging settling in the danger zone – areas that habitually flood and cause a loss of lives – is a good thing. Engineers have a moral and legal obligation to act in the best interests of the public, not just their clients, so why not install markers. Turns out, elevation markers were set up in the Clear Lake area that clearly showed water levels for surges from hurricanes of various categories. Property sales dropped so dramatically that realtors and developers complained vehemently and the markers were removed. The takeaway: given enough information, parents will not knowingly endanger their families. The other takeaway: economics trumps safety. Bloom/Stagner: With the exception of deaths due to basement parking lot flooding during Tropical Storm Allison, all fatalities, while tragic, have resulted from people driving into flooded underpasses and not from structural flooding. RAF: This perhaps one of the crassest statements that anyone who has lost a loved one can read. A Toyota RAV4 driven by Mr. Apolonio Fuentes was sucked 1000 feet under I-10 in April 2009. The implication is that those who died due to driving into deep water in underpasses somehow should be removed from the statistics because it was their own stupidity that killed them. That is unconscionable. In blinding rain, even people familiar with a route can be tricked into believing they are on the roadway, rather than traveling to their death. Investigators believe that during the 2009 freak West Houston thunderstorm, Apolonio Fuentes thought that he had turned into the drive to the Sam’s Club gas station where he could get gas or wait under the awning until the rain dissipated. Tragically, his car was sucked 1000 feet into massive pipes under I-10 by huge detention pond pumps. 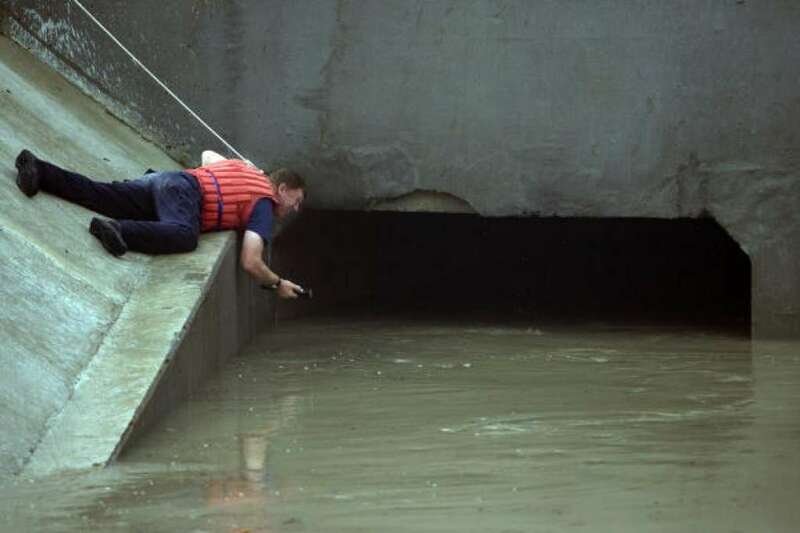 At the time of the flood, TIRZ, HCFCD and TxDOT engineers had been arguing about what type of protective grating they wanted to use at the pipe entrance. Sadly, this argument had been going on for quite a while. Had grating been in place to cover the pipe entrance, Fuentes might have survived. Ironically, just months before the devastating rains, TIRZ 17’s engineering firm, Lockwood Andrews & Newman (LAN) – who is being sued by the attorney general of Michigan for its role in the Flint Lead Water Contamination Crisis – had removed land around the nearby channel from the 100-year floodplain. Should it have been removed from the floodplain? Given that water was so high and the channel was indistinguishable from a nearby road, probably not. Today a multistory apartment complex and a commercial building occupy the land that once flooded. Both properties have been significantly elevated by infill dirt. Bloom/Stagner: Events such as the 2016 Tax Day and Memorial Day Floods are extremely rare. Bloom/Stagner: During the Tax Day flood, parts of Harris County received 17.5 inches of rainfall in 24 hours, and parts of Waller County received 23.5 inches of rainfall in less than 15 hours. Compare this to the size of a 100-year event — a 1 percent storm — of 12.4 inches in 24 hours. It’s important to note that a 100-year storm has a 1 percent probability of occurring every year. That means that a home with a finished-floor elevation an inch or two below the 100-year floodplain has a 26 percent chance of being flooded in 30 years — the length of a standard mortgage. RAF: Any student of probability knows that the odds of getting four 100-year events in the same area within a 2-year period are incredibly small, less than one in a hundred million, but getting as many as we have gotten in the past century can only mean one thing – it ain’t a 100-year event! Harris County has three regions for the 100-year rain: region 1 (12.4″), region 2 (13.2″) and region 3 (13.5″). In the early 1900’s, Houston-area drainage districts assumed that a 4-foot-deep ditch with a 4-foot-wide bottom would be sufficient to prevent flooding. Gradually, this standard began to change. In the 1940’s, drainage systems were designed to handle 4 inches of rain in 24 hours. In the 1960’s, drainage systems were designed to handle storm sizes based upon the size of the area being drained. The largest areas were designed to handle about 8 inches of rain over 24 hours — or a storm with a 4 percent chance of happening every year. RAF: Even so, early Houstonians were obviously aware of flooding dangers. They built in the Heights, bluffs overlooking the bayou, and built using pier and beam construction with large open ditch drainage systems. Ironically, because of poor engineering application of the Manning number** in our Infrastructure Design Manual, open ditches have been replaced by undersized pipes. If they are properly maintained, open ditches actually convey more water. And because the sunlight needed for rapid evaporation doesn’t reach inside underground storm sewer pipes, evaporation doesn’t occur nearly as quickly as in open ditches. They become breeding grounds for mosquitoes. Unlike pipes, open ditches allow water to be absorbed into the earth. ** The Manning number is an empirically derived measure of resistance to water flow. The City of Houston uses only two numbers: one for an incredibly smooth-finished concrete pipe and the other for a plant and rock choked stream. Most neighborhood open ditches are fairly well maintained by the homeowners, but rarely cleaned and regraded by the City. The majority of the projects identified by the City to prevent flooding are actually deferred ditch maintenance. Bloom/Stagner: In the 1970’s, the National Flood Insurance Program (NFIP) was implemented and engineers began modeling and mapping 100-year floodplains. But Houston-area floodplains were not fully mapped until the mid-1980’s. RAF: Acknowledging that engineers didn’t understand flooding adequately in the past is a good start. And recognizing that many existing neighborhoods were designed with poor criteria is also good. Given what we know, why are engineers allowing new developments to haul in fill dirt to simultaneously guarantee that they won’t flood while displacing their water into the existing neighborhoods almost guaranteeing that they will flood? Bloom/Stagner: In 1986, the region’s engineers began designing drainage with detention systems, and new storm sewers were required to hold and restrict the release of rainwater from a developed property so that the maximum flowrate did not exceed the highest flowrate from the property before the development was built — known as the “peak” pre-development flowrate. RAF: One beleaguered homeowner who has flooded 3 times hired a surveyor to measure his elevation relative to the nearest 100-year floodplain marker. His slab is 2-feet above the marker, yet he still had 12″ of water inside his home, even though the nearest rain gauge indicated that the rainfall was less than a 25-year event. That’s 3 feet above the base flood elevation (BFE)! And it was not a 100-year event! Why did his home flood? We think it was poor engineering and even poorer enforcement by government regulators. Bloom/Stagner: Drainage systems designed after 1986 work amazingly well. They include below-ground storm sewers sized to carry the rain from two-year events (with a 50 percent chance of happening every year). RAF: One older community nearby had their 24″ storm sewer line replaced with a 36″ in 1996. An interconnecting collector street was rebuilt in 1997 and yet another was widened and lowered in 2008. Their lowest homes are more than 2 feet above the nearest manhole covers and they are not in any mapped floodplain. TIRZ engineers supposedly extended TSARP** maps through the area in 2006, which showed 100-year level-of-service (LOS) in all but one zone. Oddly, properties to the east of a major thoroughfare that was the TSARP ending boundary are in 100 and 500-year floodplains, yet properties west, where the TIRZ did their study, are not. Elevations are essentially the same either side of the thoroughfare. If so, why didn’t the floodplains cross the road? After flooding in three less-than-25-year rain events within 7 years, recent computer modeling (2015) of drainage in their area shows that 429 of the 850 homes in the subdivision will flood in a 10-year event. Remember, their roads were reengineered using post 1986 design criteria. Clearly, not all “drainage systems designed after 1986 work amazingly well” and it suggests that the extended TSARP maps were grossly in error. Even so, the main difference is redevelopment on steroids. Every new project begins by hauling in fill dirt and elevating their low property to above the elevation of the nearby neighborhoods. The water that used to stay on their property has been displaced into the neighborhoods. Had these properties been properly mapped into a 100-year floodplain, they would not have been allowed to import fill dirt, and flooding may not have happened or would have been lessened significantly. ** Tropical Storm Allison Recovery Project (TSARP) In the aftermath of Tropical Storm Allison, the Federal Emergency Management Agency (FEMA) and the Harris County Flood Control District began a multi-year initiative called the Tropical Storm Allison Recovery Project (TSARP) that comprehensively assessed the flood risks associated with the major flooding sources within Harris County. Tanker trucks floating in I-10 inside Loop 610 during tropical storm Allison. RAF: Iconic pictures of tanker trucks floating in the I-10 trench will forever be etched in the minds of those of us living here during tropical storm Allison. And any Houstonian who has lived here long enough knows that their car can quite quickly become a victim of flood waters. In a commuter City, the loss of a car is extremely inconvenient. For most of us, our car represents the second most expensive item that we own, so using streets as a secondary drainage system for anything over a 2-year event doesn’t make us feel safe or that engineers have our best interests at heart. Under-roadway detention is one of the only places available to put stormwater runoff, yet PW&E engineers are reluctant to do so. Gessner Road is being reconstructed in an area with a huge flooding problem. Gessner Road is being reconstructed in an area with a huge flooding problem. Although District A City Council Member Stardig believes detention is being added, engineers are only bringing the road up to current 2-year standards. Now 2.7 times more water will flow down Gessner with nowhere to go except into people’s homes. It’s an uphill battle getting water detention placed under public facilities like parks and school district land where land acquisition costs are low. It shouldn’t be. But engineers who follow Bloom’s advice would like available funds going to subsidize development, not adding water detention. Bloom/Stagner: Even more detention (and retention) is required in the Overflow Area of the Cypress Creek watershed, which can more easily impact downstream properties. RAF: This comment is disingenuous. Homeowners in the Cypress Creek watershed hired a hydrologist and attorney to prove to HCFCD that the 100-year floodplain was incorrectly mapped. One intersection that was supposed to be outside the floodplain was actually 4 feet underwater in a 100-year event. It wasn’t engineers acting in the best interests of existing neighborhoods, it was homeowners – through the court system. Bloom/Stagner: Our region has also been looking at the effect of climate change on rainfall patterns. In March 2016, Harris County joined a national study by the National Oceanic and Atmospheric Administration to recalculate the 1 percent storm size for Texas using rainfall records from a longer period of time. Similar work completed for the southeast and southwest regions of the country showed that rainfall depths over time did not have statistically significant trends up or down — i.e., no climate-change effect was observed on those types of storms. RAF: These comments may also be an oversimplification of the scientific facts. The full effects of climate change on precipitation may not be well understood yet, but one thing is known: global weather is strongly affected by the El Niño-Southern Oscillation, which itself is affected by ocean heating that scientists attribute to climate change. Understanding how our weather is affected by this oscillation will require much more than a year, but it is already clear that ocean warming contributes to the energy available to power it. The winter of 2016 was the warmest on record for the Gulf of Mexico, whose water never fell below 73°F. Warmer bodies of water do correlate with more energy for storms. And there are correlations between global warming and storm effects, though perhaps not for the number of storms. Bloom/Stagner: Although undeveloped prairie land can retain some volume of water over a period of days or weeks, it cannot prevent flooding, especially during extreme events. Prairie land can reduce the total volume flowing to our existing reservoirs, but many conservation-minded citizens seem to over-estimate prairie land’s absorption capacity. Undeveloped prairie will not prevent high water levels across the landscape after extreme events. Case in point: the catastrophic flooding of downtown Houston in 1929 and 1935 occurred due to rainfall on the undeveloped prairie. RAF: Because of their extraordinary root structures, prairie grasses are capable of transporting large volumes of water from the surface deep into the soil. It’s a poor argument to say that because we flooded when more prairie grasses were in place, we should pave over the prairies. Quite the contrary, replacing prairie grasses with 50% or less detention volume guarantees that at least half of the water from a similar flood will have to be captured by an already overtaxed reservoir/bayou system. Rather than wet-bottomed detention ponds with shallow-root grasses planted on their slopes, perhaps we should plant prairie grasses alongside the ponds and wherever we have open space. Wetlands, however, are quite another thing. Save Buffalo Bayou makes a compelling case for preserving wetlands. They also rebut much of what Bloom and Stagner say. Bloom/Stagner: Preservation of land along bayous can help reduce flood damages for new development in the urban fringe, and this is already happening. RAF: Preserving land along bayous can reduce flood damages, however, more often public and private engineers avoid doing what’s best for the common good. When HCFCD released their Charting the Bayou, they identified numerous locations for detention along Buffalo Bayou. It was almost as though they were charting the Bayou for developers. Many of those sites are now elevated and paved, affording new condominium owners up-close (but elevated above floodwater) views of nature. Bloom/Stagner: In the Cypress Creek Overflow area and in other portions of western Harris County’s urban fringe, floodplain managers, public agencies, engineers, and developers continue to implement “frontier programs” to plan out preservation corridors and to thoughtfully acquire and construct appropriate drainage facilities. Bloom/Stagner: However, land preservation does nothing for existing developments. Removing development is a great idea and can help reduce flood damages, but must be evaluated using a benefit-to-cost ratio. Paying $1 million to buy and remove 10 homes from the floodplain is not as cost-effective as paying $1 million for channel improvements that shrink the floodplain and effectively move 20 homes out of it. Also, there is the unaddressed question of who should pay for these types of programs. RAF: Paying the homeowners for the ten lowest elevation homes, removing them then replacing them with a detention pond planted with prairie grasses might save a whole neighborhood from flooding. If the homes are not in a floodplain or put into a Special Flood Hazard Zone (SFHZ), then the City can issue permits to redevelopers that allow up to 5000 cubic yards of fill dirt to be added. The property will be redeveloped, will not flood, and the problem is solved. Right? Wrong! The displaced water is simply moved to another home, neighborhood or business development with a lower elevation that will begin experiencing increased flooding. Bloom/Stagner: Protection of wetlands in the frontier areas is a good practice to absorb rain and storm-water runoff and to help reduce flood damages; however, the statutory authority to do this currently rests with the federal government. While local governments might choose to enact their own rules regarding wetlands protection, the value of those rules would have to be considered against the added administrative burden of local governments creating programs that overlap with federal statutes. RAF: According to Dr. Sam Brody, the Army Corp of Engineers, who manage our floodplains, currently grants 99.9% of requested permits in existing floodplains. Credits for wetlands mitigation are often bought in mitigation banks miles away from the watershed or in another unconnected watershed where they will do little to prevent local flooding. RAF: As engineers, we hope Bloom and Stagner recognize that man-made flooding is caused by actions that man has taken that make natural flooding worse. Clearly, we can’t end all flooding, but we can end our contribution to it. We can stop making it worse. Elevating, then paving large swaths of land, changes flow patterns dramatically. That displaced water has to go somewhere. The removal of prairie plants capable of soaking up large rainfalls and replacing them with homes, businesses, and parking lots increases storm water runoff which makes flooding worse. Paving over permeable ground contributes to Houston subsidence because the water is no longer available to recharge the aquifer. Cultivating plants that are capable of transferring surface water deep underground helps to compensate for the loss of permeability, improving aquifer recharge. Runoff water from all the new and elevated impervious surfaces has to be dealt with, so that homeowners don’t flood. Moving the water faster from one area to another simply moves the problem elsewhere. The uncomfortable fact is that we have worsened natural flooding dramatically and continue to do so. Ironically, denying that there is a problem in the face of overwhelming evidence to the contrary, emphasizes the fact that engineers are part of the problem! Bloom/Stagner: In spite of its flood-prone nature, Houston has flourished and people still continue to choose to live here. In 1900, fewer than 100,000 people lived in Harris County. Today more than 4 million do. Houston has grown to be the fourth-largest city in the United States and a key economic engine for Texas. About 200 people move to Houston every day. Houston has prospered and has provided affordable homes, schooling, careers, cultural opportunities, and many other amenities while being located in a flood-prone Gulf Coast area. According to the U. S. Department of Commerce, the Houston region’s gross domestic product has grown from $241 billion to $503 billion during the period from 2001 to 2015. RAF: We agree. Houston is an incredible economic engine for Texas and the nation. The reality is that Houston is an elevation challenged city situated beside a warm and expanding body of water capable of supplying energy and moisture for some massive storms. Coastal flooding is becoming more prevalent. Storm surges are becoming more of a concern as population and vulnerable industry increases. FEMA spends more money on floods than any other emergency and is currently $25B in the red despite recent increases in the costs of flood insurance. This cannot continue. Consequently, FEMA is changing the way that they define floodplains. Instead of defining riverine 100-year floodplains, improved LIDAR technology is allowing rapid accurate elevation mapping so that risk assessment will be defined by relative elevations. For example, if you’re in a natural “bowl,” you will have a higher risk of flooding than someone on a “hillside,” even if you’re not along a waterway and even if the “hillside” is only a few feet higher. This has huge implications for Houston where a few feet in elevation can make the difference between a “hillside” and a “bowl,” between flooding or not. Suddenly, a developer importing fill dirt to elevate his property may automatically cause older nearby homes to be reassessed. That’s why Residents Against Flooding is advocating for 100% mitigation. We certainly agree that elevating properties above the BFE prevents flooding, but not at the expense of existing homeowners. Bloom/Stagner: Hydrologists, floodplain managers, and engineers in the private and public sectors have done a remarkable job in reducing flood damages in our region. We will continue to make progress in this area, while addressing development, changes in rainfall patterns, and population growth in a sustainable manner. As president of the Texas branch of the American Council of Engineering Companies, Steve Stagner advocates and lobbies for engineering firms. Michael Bloom works for R.G. Miller Engineers, the firm that submitted the faulty drainage analysis of the Fidelis property at the NW corner of Bunker Hill Road and I-10. Four land parcels were combined, which required that the property be replatted so “Grandfathering” should not have been applied. It was. In their drainage analysis for the property, R.G.Miller Engineers claims that nearly 2.6% previously flowed into the TxDOT’s I-10 drainage system, a little more than flowed into Bunker Hill (6.2%) and the balance (about 91%) flowed into Briar Branch Creek (W140-00-01). With their new drainage system, a little more than 59% flows into Briar Branch Creek, none flows into Bunker Hill and approximately 41% flows into the I-10 drainage system. Given that they have allegedly reduced the flow into Briar Branch Creek by 20%, Fidelis was able to justify to Clay Haynes at HCFCD that they do not need detention. Elevation m aps show that water flows across the property from NW to SE. Even the flow analysis done by LAN shows the water flowing to the southeast. Since any drainage system Daniel Industries might have had was no longer functional, it’s unlikely that water flowed uphill into Briar Branch Creek as the drainage study suggests. And none flowed into the TxDOT system, which was on the other side of Old Katy Road and the MKT rail line. The railroad served as a dam to water flowing south. Instead, water was captured in the open ditch along Old Katy Road or the huge ditch just north of the MKT line. From there water flowed into the Witte Road drainage system, under I-10, and into the drain pipes under Memorial City Mall. 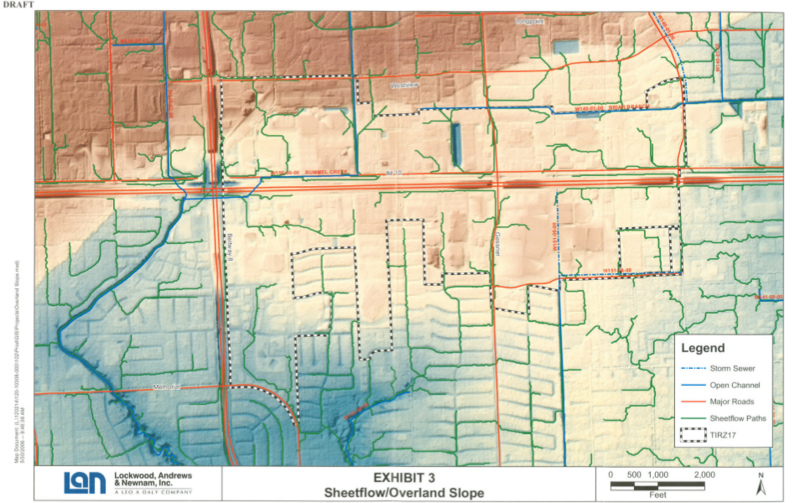 After the huge pipes were installed along Briar Branch Creek and the entire 44-acre property was elevated an average of 1.5 feet, the adjacent neighborhood was flooded during a freak unnamed storm on April 28, 2009. For the area that flooded, rain gages showed that it was less than a 25-year storm. 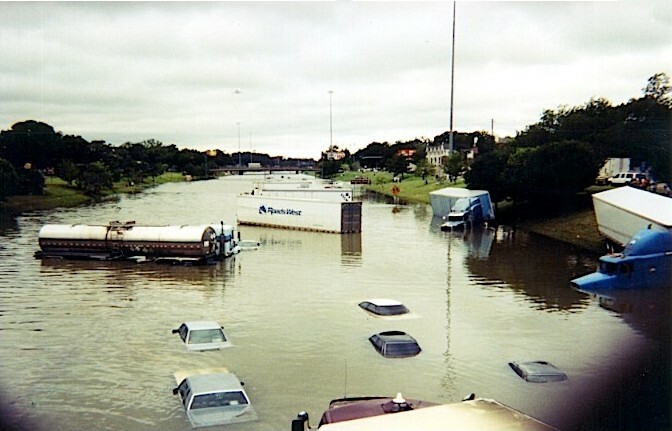 Fully a year before the flood, members of the community had warned City Council, Houston Public Works engineers, and HCFCD that failure to properly mitigate for stormwater would cause flooding. When the area indeed flooded, engineers absolved responsibility by calling it a “once-in-a-lifetime event” and an “Act of God.” We knew better. Our flooding was man-made. And it was preventable. Shortly afterward Residents Against Flooding was born. Residents Against Flooding is suing the TIRZ 17 and the City of Houston in federal court to bring needed changes to how we handle flooding in Houston. The Texas Tribune is a nonpartisan, nonprofit media organization that informs Texans about public policy, politics, government and statewide issues. Its mission is to bring greater transparency and accountability to public policy, politics and government through news, data and events. It has the largest statehouse news bureau in the United States.